As I made my way to the Armony hotel on the morning of Saturday, the 8th of November, I walked along the former line of the western wall (it was actually a strip, not a single wall). While it would have been a lofty task to damage all or most of the thousands of balloons, its clear that a significant number had been destroyed. Some of the thin, black posts were knocked over or bent, and other balloons were simply popped, leaving their stands holding limp blobs off lifeless latex. More importantly, some of the remaining balloons had been repurposed to display radical messages. (See photos below.) One, for instance, had two boxes, beside “Berlin wall” and “European Wall,” with the first selected with an approving “X.” Tellingly, most of the balloons had been repaired or replaced by the following morning. 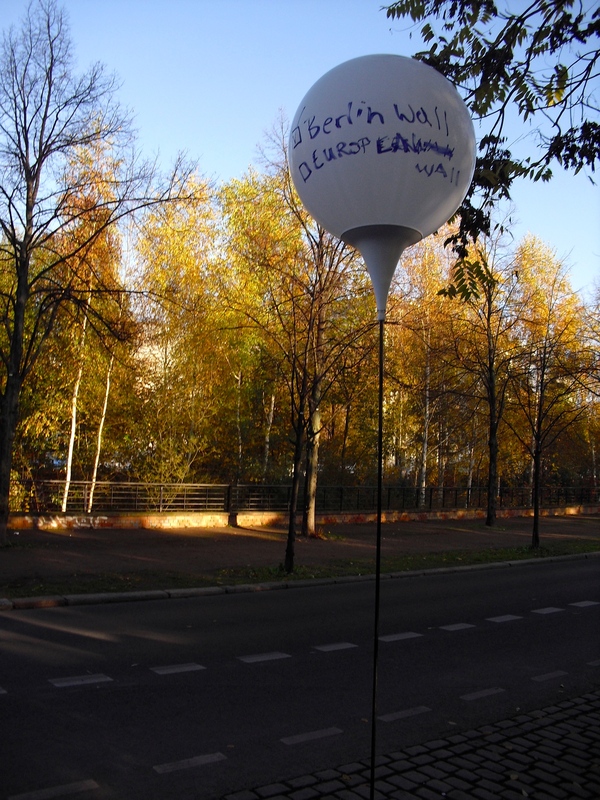 Throughout Berlin activists placed signs and destroyed memorial balloons. While its unsurprising that Christopher Bauder‘s light instillation would be damaged in an area famous for its anarchist bonafides, I found that politically motivated vandalism to be representative of much of what I saw walking through the city. (Granted, I didn’t walk the entire 26 mile perimeter, but much of it.) On the same weekend, border activists protested at the Bulgarian-Turkish border and other places representative of the EU external border to highlight the disparate concern for life. Signs, demonstrations, and graffiti remind us that, while the Berlin wall resulted directly in the deaths of 136 people, tens of thousands have died trying to enter the European Union. Indeed, at least 360 immigrants drowned in one single incident in 2013, and country’s such as Spain and Italy continue to treat migrants inhumanely. Still, one could argue that they are simply doing the dirty work of more influential EU members. Many migrants see the Balkan and Mediterranean states as layovers to more prosperous countries to the north, where they will there file for asylum status. In response, Germany has revised its list of “safe third countries” in order to create a pretext for denying status and sending migrants elsewhere. Right wing bloggers discuss migrants and the November 10th Bulgarian border protest. While the comments of folks such as “Fortress Europe” bother us, it may be because, like a mirror, they force us to recognize our own hypocrisy. We may not say that migrants are animals whose lives don’t matter, but our (in)actions speak volumes. The deaths of migrants on the global border between the “developed” and underdeveloped worlds speak to profound disparities in the system we have created and continue to enjoy. In the United States, we benefit from the cheap labor of migrant campesinos at home and maquiladora employees abroad but have little regard for the humanity of those workers. ) When children and mothers fled Central American violence (engendered, at least in part, by U.S. policy) in the summer of this year, many in the U.S. declared it a “crisis,” not of humanity but of security. In 2010, Mexican criminals in Tamaulipas slaughtered 72 migrants like animals, and few people seemed to care. Fortunately, the recent disappearance of 43 students in Mexico has garnered more attention, but that outrage only supports the assertion that the students’ lives are perceived to be more valuable than those of the migrants. Finally, recent events in the U.S.(examples: 1, 2, 3) have reminded us of what we know all to well: the lives of people of color, queer folks, and, especially queer people of color aren’t worth much either. While borders perhaps may be inevitable, it’s time we recognize the ways they delineate what counts as human. If we really believe that each life inherently has value, we need to take radical steps to acknowledge that. If we don’t believe in the fundamental dignity of each human life, let’s at least spare ourselves the embarrassment and hypocrisy of the security discourse. Perhaps that’s why I find “Fortress Europe” much less nauseating than Fox News Sunday. J. Aaron Waggoner is Visiting Scientist in B/Orders in Motion at the European University Viadriana and Doctoral Candidate in History at the University of Texas at El Paso.